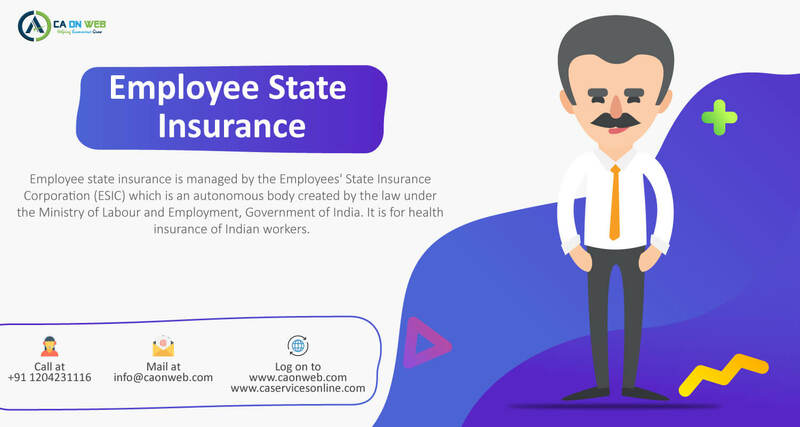 Employee state insurance is managed by the Employees’ State Insurance Corporation (ESIC) which is an autonomous body created by the law under the Ministry of Labour and Employment, Government of India. It is for health insurance of Indian workers. Those entities having 10 or more than 10 employees taking wages up to Rs. 15000 a month are mandatorily required to register under ESIC. ESIC registration may be done through us online. Under the ESIC scheme, the employer contributes 4.75% of the total monthly salary and employee needs to contribute just 1.75% of their salary every month. If the salary of the employee is less than Rs. 100 per day, in that case, the employee is exempted from contributing to ESIC fund. How to register under ESIC? You can connect with our experts and submit the requested documents, We will help you get registered under ESIC. What is the type of business which attracts ESI registration? Shops (Bigger retail shops such as supermarket), Hotels or restaurants not having any manufacturing activity, but only providing service, Theatres, Private Institution etc. Is it mandatory for employers to register for ESI and PF registration? Yes, it is mandatory for employees to register under ESI and PF registrations if they come under the requirement. What is the contribution rate to the ESI fund? The eligible employee needs to contribute in total 1.75% of their salary (basic allowances). Registered Employers need to deposit 4.75% of paid salary (basic+allowances) to ESI corpus every month. What documents are needed to register under ESIC? What is the compliance after an entity is registered under ESIC?